Wounds can include anything like cuts, scraps, scratches and also the wounds after accident or injury. 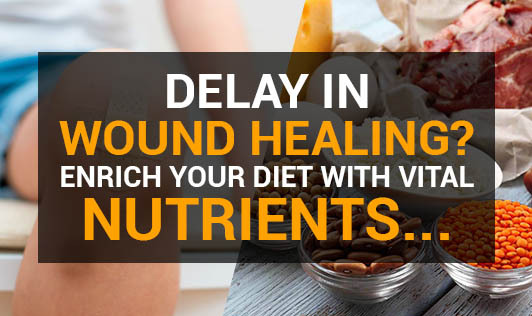 Adequate nutrition is required for forming new tissues, for wound healing and maintaining the healthy skin. A person with a wound requires extra macro and micro nutrients in their daily meal. The below nutrients can help in the quick progress. Protein - It is called as a power food that helps to build the tissues and collagen. At least 2 servings per day of fish, poultry, eggs, cheese, milk, yogurt, sprouts, legumes, and nuts are essential as it can provide adequate protein requirement for the day. Vitamin C - Vitamin C acts as the cofactor in the production of collagen. Vitamin C is rich in fruits like amla, gooseberry, sweet lime, potatoes, broccoli, sprouts, strawberries, spinach, cabbage etc. Vitamin A - Vitamin A is necessary for normal cell growth and development. Vitamin A is found in dark green leafy vegetables, papaya, orange, carrot, liver etc. Vitamin k - Vitamin K is important for blood clotting. Sources are asparagus, broccoli, kiwi, spinach, lettuce etc. Zinc - Zinc is required for protein synthesis and is also a co-factor in enzymatic reactions. Zinc sources are wheat bran, sesame seeds, meat and poultry, banana, nuts etc. Copper - Copper plays an important role in the healing process of skin sores and infections. Copper is present in mushrooms, turnip, nuts and non veg. Apart from the foods that are mentioned above, take care of the diet through extra calories and carbohydrates. Speak to the physician if you require any multi vitamin supplements!